Thus begins the essay “The Flaw” by M.F.K. Fisher, one of the most subtle anti-war and anti-Fascist pieces of writing in English. “The Flaw” was published in Fisher’s 1943 essay collection, “The Gastronomical Me,” a book many readers and critics consider her best. The ostensible subject of the essay is a train trip, taken by Fisher and Tim Parrish in the summer of 1939. (“Chexbres” is Fisher’s pseudonym for Parrish, who had recently suffered an amputation due to Buerger’s disease.) They were returning from their final trip to their house near Vevey, Switzerland, before the outbreak of war; on September 1, Germany would invade Poland. But the real subject of the essay, hidden among curling radishes and pats of butter and the bottle of Asti Spumanti in the train’s old wood-paneled restaurant car, is the terror of impending war. 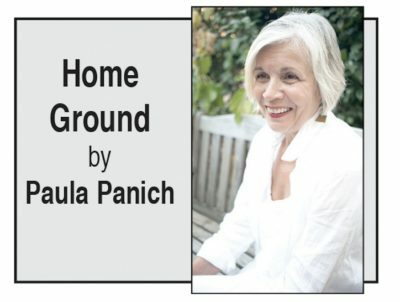 Why revisit an almost 80-year-old essay? It’s because of the plucked chicken. 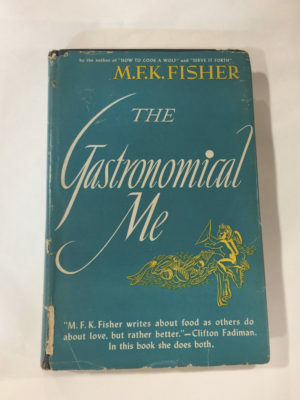 “THE GASTRONOMICAL ME,” considered M.F.K. Fisher’s best. The Mussolini quote goes something like this: Pluck a squirming chicken feather by feather; it won’t become obvious until it’s too late. He meant people will not register the loss of their freedoms if it happens bit by bit. In “The Flaw,” Fisher writes of the details of that train. There are two waiters, a young one with a “smooth almond face,” and the other, with a “face [that] was truly the most cynical I have ever seen … ” who in between meals sit sorting lettuces. Fisher describes the bread and beans and salami and hard-boiled eggs the couple ate, and the wine they drank. Fisher and Parrish are well- known on the route, and are offered elaborate courtesy. Fisher hints that something is amiss with Tim. About nine of the 11 small pages of the essay reveal the cocooned, sensual world of this train. Yet two intrusions interrupt the idyll. Three “Strength-Through-Joyers,” young men with backpacks, enter the train (Strength Through Joy was a Nazi movement to encourage leisure, in force 1933-1939); and then another trio board: two guards, black shirts visible beneath their coats, shackled to a pale prisoner. The last two pages of the essay, as happens in work only by writers of great feeling and skill, open up this hermetic scene to our shared humanity. “It was good to be eating and drinking there on that train…,” Fisher writes. But their happiness evaporated. Fisher could see that Tim’s face was again full of pain. They hear shattering glass. A waiter finally tells them, after they finish eating, that the prisoner has slit his throat on the edge of a broken windowpane. The border police have cleaned up the “muss,” he tells them. Fisher writes: “Chexbres was a man with one leg gone … a small wracked man with snowy hair and eyes large with suffering. And I was a woman condemned, plucked at by demons, watching her true love die too slowly. “There on the train … we knew for a few minutes we had not escaped. We knew no knife of glass, no distillate of hatred, could keep the pain of war outside. By 1940, Fisher and Parrish were living in another home, in Hemet; Tim Parrish would die there in 1941.